Scared to tackle sushi yourself? This is the course for you! Join our 12 Week Certificate students and allow Shermin Mustafa to demystify this jewel of Japanese cuisine. She will use fresh fish straight from the boats in Ballycotton Bay to create sublime sushi and sashimi. Whilst so many of us love eating sushi, making it for the first time can be intimidating particularly as it’s common-knowledge that sushi chefs train for years to master the knife skills and presentation needed to create world-class sushi. This course takes the mystery… and stress… out of making sushi, Shermin will start by explaining the ingredients, basic equipment and techniques required, giving you the confidence to serve it to guests at home or in a restaurant. Sushi gets the ‘thumbs up’ from cardiologists and nutritionists – not least because it is based mainly on fresh fish, seaweed, vegetables and rice, but it is also low in saturated fat, high in vital omega 3s and rich in vitamins and minerals. Shermin is a beautiful cook and fluent teacher who has taught at the Cookery School for many years. 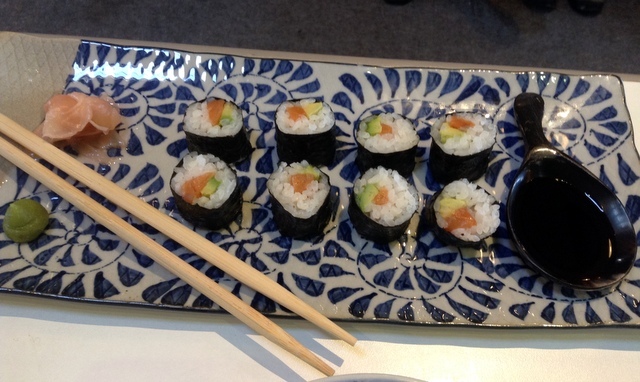 During this half-day course she will show you how to make at least eight different types of sushi as well as sashimi. Students will have the opportunity to taste all the dishes prepared during the demonstration. Courses on during week of 10th July.